This famous peak is the highest point in Kazakhstan (7,010 m) and the most northerly 7,000m peak in the world. The mountain sits on the border of three states - China, Kyrgyzstan and Kazakhstan. The summit of Khan-Tengri is difficult to reach and therefore extremely attractive to both mountaineers and lovers of adventure travel. The northern part of the mountain is situated in Kazakhstan. The dream of many mountaineers is to climb the north face of Khan-Tengri. Khan Tengri Peak is the most northern peak over seven thousands meters height in the world, and is one of the most beautiful mountains in the world because of its perfect marble peak. 1,200 years have passed since Khan Tengri was mentioned in the Chinese chronicles for the first time. M. Pogrebetskiy, a Ukrainian mountain climber, conquered it for the first time in 1931, having traversed the southern side of the peak. This route is considered to be a classic even today. Khan Tengri is located in a remote region on the boundaries of Kazakhstan, Kyrgyzstan and China. 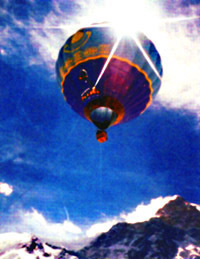 Most climbers reach the base camp at the foot of Khan Tengri by helicopter. 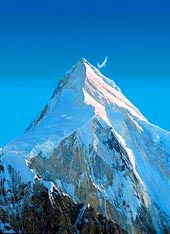 Ascending to its peak is the goal of many climbers all over the world. It requires a minimum of fourteen days to reach its top. The region around the mountain includes many peaks of 6,000m in height: the Marble Wall (6,400 m) is among them. It is an area of alpine valleys with the most beautiful lakes and rivers. Due to the proximity of the Chinese border, this region requires special permission to enter (a permit). Khan Tengri - 2000, the First International Festival. Khan Tengri - 2000, the first local International Festival for climbers, was organized by the "Asia Tourism LTD", Tourism Company on the threshold of the second millennium with the support of the Almaty Region Akim. The Central Tien-Shan Mountains the Republic of Kazakhstan were the place of the festival conducted from August 6 to August 27, 2000. Over 520 participants from 30 countries, visited the Khan Tengri 2000 festival, including such famous mountain climbers, as Cimono Moro (Italy), Alexander Lvov (Poland), Valeriy Babanov and Vladimir Karatayev (Russia). Among 280 participants trying to reach the Khan Tengri Peak (7,010m), only 53 climbers were professionals and 227 were amateurs. 50 people were involved as guides for the rescue services. The climb to the mountain began from the base camp on the Inylchek Glacier, to which the participants were delivered by helicopter (organized for 360 participants). The result; only 79 mountain climbers reached the top of Khan Tengri Peak, and each of them was awarded a Certificate of Ascent. The festival was also visited by various officials; Kazakhstan State representatives, the US Ambassador with his family, and diplomatic representatives from Indonesia, Pakistan and Canada. Much information and reference to the Festival can be found on various web-sites today. The event is covered in many domestic and foreign magazines, and a documentary film was also produced. In short, the festival was a great success. Climbing Season: beginning of July to the end of August. Accommodation: 2 nights in hotel; 18 nights in tents. 1st day - Arrival in Almaty. Meeting at the airport. Overnight in hotel. 2nd day - Transfer to the Akkol base camp 2,300 m, 380 km, 7 hours of travel). Accommodation in 2-3 person tents. Provision of three meals a day, shower and toilet. 3rd day - An acclimatization trip to 4,000 meters. 4th day - Arrival at the Northern Inylchek base camp by helicopter (flight duration 20 minutes). 5th -17th days - Ascent of Khan Tengri Peak along a prepared route, Intermediate camps: #1 (4,800 m), #2 (5,600m), #3 (5,900m), #4 (6,400m). Fixed ropes are used on the most difficult parts of the route (1,200-5,500 m, 5,700-5,900 m, 6,200-6,750 m). 18th day - Helicopter flight from Northern Inylchek base camp to Akkol base camp. 19th day - Return to Almaty. Overnight in Almaty Hotel.